Edward John Cassidy was the great great grandson of William Cassidy, the oldest known Cassidy in the Drumbar, Clogher, Auglem line. The following information collected and written by Edward John’s granddaughter, Kathleen Anne O’Callahan Payne of Yuba City, California. Edward John was born on a farm in Drumbar, (the town land) in County Donegal, Eire (Ireland). 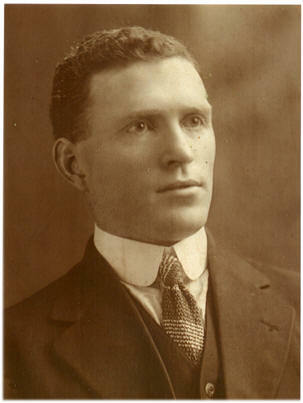 Edward or “Eddy” was one of 8 children of Francis Cassidy and Anne (Kelly). His father, Francis, died when the children were young. Anne was a beautiful woman inside and out and raised her children to love and honor God. The family lived frugally but well cared. All of the children helped on the farm, cutting turf at the bogg, baking, knitting, … They gathered kelp from the sea to use as a natural fertilizer for raising potatoes. On the 90-acre farm, they raised dairy, oats, barley, hay and flax and had six paid day-laborers. Eddy attended the local school and only attended four years of formal education, but it would be equivalent to eighth grade in the United States. Eddy had a constant thirst for knowledge all of his life, always asking questions, continued with extension correspondence, LaSalle University,and could recite poetry without pause. A story that Eddy was fond of telling, was the day that his sister, Mary Agnes, asked him to go to the well to get buckets of water for the kitchen. Mary Agnes promised Eddy bread and jam. When he returned with the buckets of water, there was no bread and jam. Red haired Eddie returned to the well and also returned the water! Eddy received his Sacraments at Clar Chapel (St. Agatha’s) in Donegal. The family went to Sunday vespers regularly. Eddie also attended the Saturday night dances, of course after chores and prayers. He enjoyed Irish music and history, but had no use for the misuse of alcohol. After saying good-bye to loved ones and dear old Erin, Edward John sailed for a new life in America, in 1912. * He tried to find work in New York, but the signs were posted “No Irish Need Apply”. Too many immigrants at this time, so he made his way to Macon, Georgia to a find his friend, Andy McGinty who had several bars in Macon. Edward worked in the industry and owned several bars, though he never imbibed. He had saved a little money and Edward made his way to San Francisco, where his cousin Annie (Cassidy) and her husband, Pat Loftus and family resided. He lived in this home on Liberty Street, off of Delores, in the Mission District. The house belonged to Aunt Sarah (Cassidy) and Uncle Tom McNulty, (origin unknown) and wonderful people. When he had saved a little money and felt he could support a wife and family, he gave it considerable thought when a mutual friend, Con Murray, suggested Bridget McNulty, who was currently working in Philadelphia at the time. Ed had met Bridget in Ireland at one of the dances. First Ed corresponded to her family in Ireland, asking permission to “court young Bridget” then proceeded to corresponded back and forth with the lovely Bridget. He proposed and sent the Tiffany set diamond ring through the mail. Bridget came by train to S.F. in 1917 and they married on May 28, 1917 at St. Peter’s Catholic Church. a car and drove around Twin Peaks for their honeymoon. Ed had a bar on Mission Street, which he ran during part of WWI and they lived in a small apt. in the Mission with other friends and newlyweds as neighbors. (One such neighbor was “Auntie” Hemmingway”.) This apt. is where they brought home their first-born child, Patricia Mary, born on March 17, 1918. The Cassidy’s had many “adopted” relatives. Ed closed his Mission Street bar due to Prohibition rather than bootleg to make a living. He was a fine man of integrity. He left bartending, and became a Private Investigator for Southern Pacific Railroad, a “Pinkerton Man”. His route was from San Francisco to San Luis Obispo. Edward and Bridget purchased their first, sweet cottage, on Merritt Street, (now upper Market St. and below Twin Peaks). Sometime after Anne was born, around 1923, the family relocated to 4660 18th Street in San Francisco, a pair of flats with a downstairs rental. The upper flat had 2 bedrooms with 1 bath. There was an extra lot on the uphill side that had potatoes, dahlias and roses growing in it, along with a double garage. 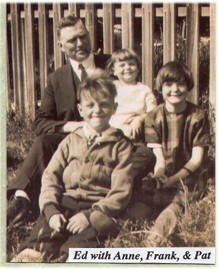 The children, Patricia, Frank, Anne & Regina attended Most Holy Redeemer Grammar School and Church. Ed had been a member of Knights of Columbus, but gave it up to be more available as a loving father and help his children with their school work, and mathematics was his strong subject. Ed was a very loving, dedicated family man, holy, a good-provider and a true entrepreneur. He bought a laundry route with the Independent Laundry about the time Regina was born in April of 1927. Edward had not driven a vehicle much, and had to learn to drive a truck and become familiar with the S.F. streets. Later Ed bought a partnership in the Cadillac French Laundry, 390 Eddy Street, in downtown San Francisco. This was a family business, so Bridget and daughters Pat and Anne worked there. Pat had a mind for business and did the bookkeeping, and Anne filled in now and then. At this time, Regina was the youngest at home and was Ed’s companion when Bridget began helping at the laundry, while she still continued doing hired housekeeping at the Chipman estate in San Carlos and catering. Bridget always had the home meals prepared and clean clothes ready for her family, even though she worked outside of the home each day. This was during Depression times and the Cassidy household never lacked sufficient good food, and often purchased in large quantities. In about 1939 Edward sold his partnership in the laundry due to poor health, and invested his capital in a 24-unit apartment house at 1650 California Street, between Polk and Van Ness, “The Nottingham Apartments”. In 1948 the Cassidy’s sold The Nottingham Apts and purchased a 4-apartment complex in the Richmond District. Later they sold this apartment unit and retired to quiet, little Glen Ellen, in Sonoma County, which reminded Ed of Ireland. They purchased a modest Victorian on Arnold Drive, opposite Hill Road. This house backed to a creek and was within walking distance to the Post Office and the small town. The home had a front porch and Ed did extensive stone work on the grounds, built a stone fountain in the front yard and also a large BBQ and huge picnic table. 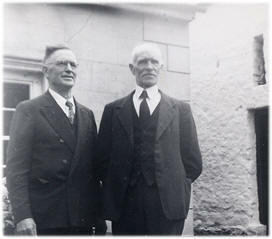 Edward & Brother Hugh, Drumbar 1948. Also in 1948, Ed with Bridget made his only trip back to the family farm and helped rebuild the stone shed (cow barn). Just a few short years later, in 1951, Ed was diagnosed with an aneurysm of the aorta. No surgery procedure was yet available. He had a lingering and very painful illness and was cared for by his wife and adult children and son-in-laws. We were all devastated at the passing of this fine husband, father, and grand father. He was buried at Holy Cross Cemetery in Colma, CA. * Immigration year established from information a photograph with brother Jamey Cassidy , taken in USA, 1912.